Foradori wines have come a long way in the last 58 years, but then greatness always takes time. From mastering tinajas and teroldego to organic winemaking, this is Elisabetta’s story. Polish author, Ryszard Kapuściński once remarked, “A journey, after all, neither begins in the instant we set out, nor ends when we have reached our doorstep once again. It starts much earlier and is really never over, because the film of memory continues running on inside of us long after we have come to a physical standstill”. I had wanted to visit the Foradori winery for years. The wines I had tried from the estate in the past were striking, and etched themselves in my memory. The images I had seen of a woman, Elisabetta Foradori, in her vineyard surrounded by the towering rock faces of the Dolomites were equally as powerful. Prepossessing, magnetic in their attraction. It was a place I had to visit. I set out with friends from Lake Como at around 4am after an extended Sunday pranzo at their parents’ house. A typical Italian car journey. Friend talking constantly in the back about how deadly unlicensed heavy vehicle drivers are, while his sister made overseas phone calls, phone tucked under her ear while steering with her knees and gesticulating with both hands. It could be a long morning. As we hurtle along the A22 into Trentino in the half light of dawn, thoughts of homicidal truck drivers fade as the peaks of the Dolomites thrust out of the earth on either side of the freeway. We’d made good time. Too good in fact, and we pulled into Mezzolombardo, the town where the Foradori winery is located, just as the local cafes raised their shutters allowing us a leisurely breakfast before we were due to head to the winery and meet our host. On arriving at the winery, we are warmly greeted by Elisabetta and taken for a walk through the vineyards and herb/vegetable garden, all biodynamically farmed and looking healthy and vibrant in their spectacular setting beneath the Dolomite peaks. She talks of the estate’s history. Located in north-western Italy between the DOC’s of Veneto, Trentino-Alto Adige and Friuli-Venezia Giulia, the estate was purchased in 1939. Elisabetta’s father, Roberto, took over and bottled the first Foradori wine in 1960. Elisabetta’s father passed away unexpectedly in 1976 and after finishing her oenology studies, she took over the winemaking duties at the estate in 1984 at 20 years of age. 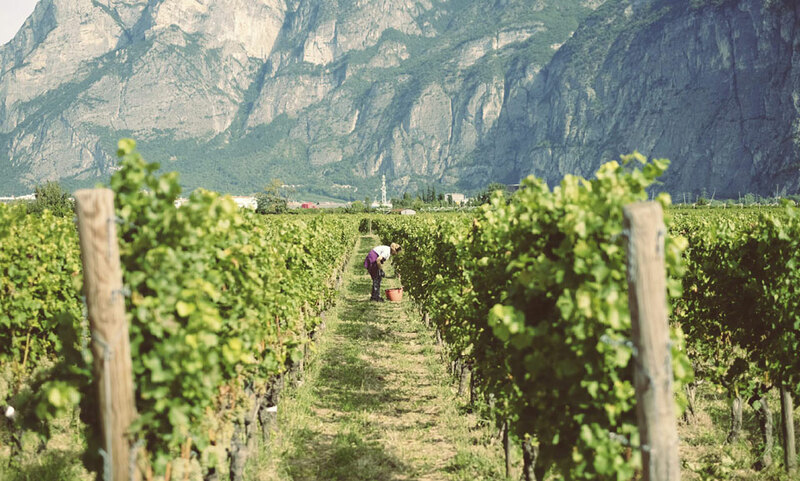 At that stage, the region was at a crossroads, with growers ripping out teroldego, a variety native to the Trentino region in favour of international varieties such as cabernet sauvignon and merlot. 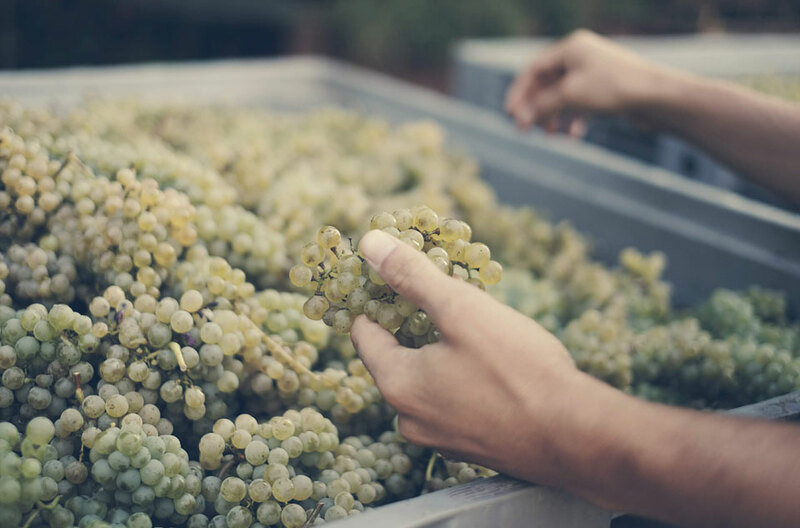 The wines from the region, many of them produced in co-ops, were one-dimensional; the farming relied on chemical use and the aim was for the highest possible yields. “[Tinajas] are like people, they can have their good days and their bad days”. Elisabetta took a different tack. She saw greatness in teroldego and began concentrating her efforts on the vineyards. She gradually began replacing the pergola trellising (favoured in the region for producing higher yields). Harvesting was carried out by hand and instead of concentrating on the two clones of teroldego that made up the majority of the plantings in the region, a mass selection was made from Foradori’s oldest and best vines, which over time has led to the registration of fifteen different clones of the variety, some even grown from seed. It was a journey of questioning, experimentation and innovation from the moment Elisabetta took charge. The estate gradually moved away from the conventional farming methods of the time, aiming for a more organic approach. The wines improved. A riserva Granato was released in 1986 from the oldest vines – still on pergola trellising and aged in French barrique – and the single vineyard wines Morei and Sgarzon joined the lineup in 1987. The reputation of the winery grew and Foradori wines began to stand out in the region. Drawn to the writings of Rudolf Steiner, Elisabetta began experimenting with biodynamics in 2002 and, impressed by the changes in her vineyards, gained full Demeter certification in 2009, joining the VinNatur organisation along the way in 2007. Foradori uses clay Spanish tinajas to age their wines. As is often the case with wineries that farm according to the biodynamic principles, besides breaking their reliance on chemicals and creating healthier soils, they seem to connect the farmer more deeply with their land, enhancing the powers of observation, drawing them closer to the ebb and flow of site and season. Presently, the Foradori estate covers 28 hectares – 75% teroldego, 15% Manzoni bianco (riesling crossed with pinot blanc), 5% nosiola and 5% pinot grigio. The teroldego and pinot grigio are grown on the Campo Rotaliano plain with its gravelly, alluvial soils rich in limestone and granite, the nosiola and Manzoni are higher up on the clay-limestone soils of Cognola in the Fontanasanta hills just above Trento. Changes also occurred in the cellar, too. Indigenous fermentation was reintroduced, varying percentages of stems were included in the ferments, sulphur use dropped, the wines became vivid, detailed and tensile with an obvious increase in fruit purity. Trentino teroldego started to come of age. 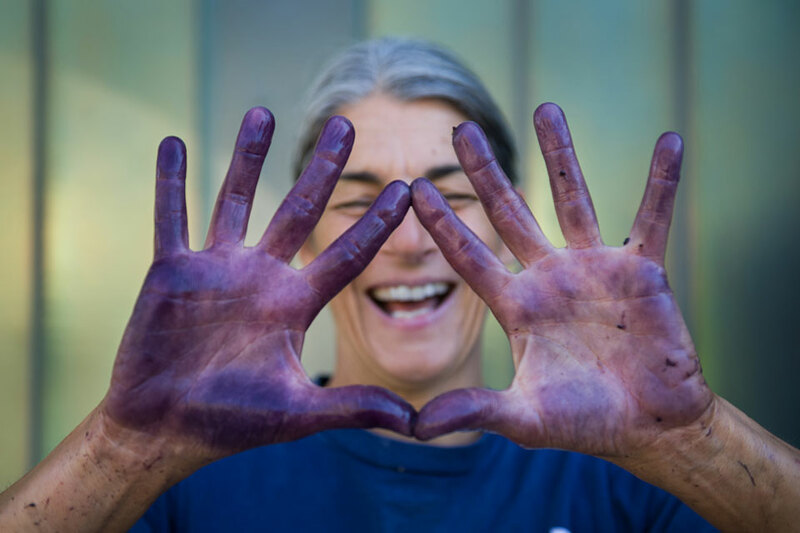 Elisabetta Foradori gets her hands dirty to make great wine. Along the way, and inspired by the wines of Giusto Occhipinti at the COS winery in Sicily, Elisabetta began to experiment with ageing wines in clay. 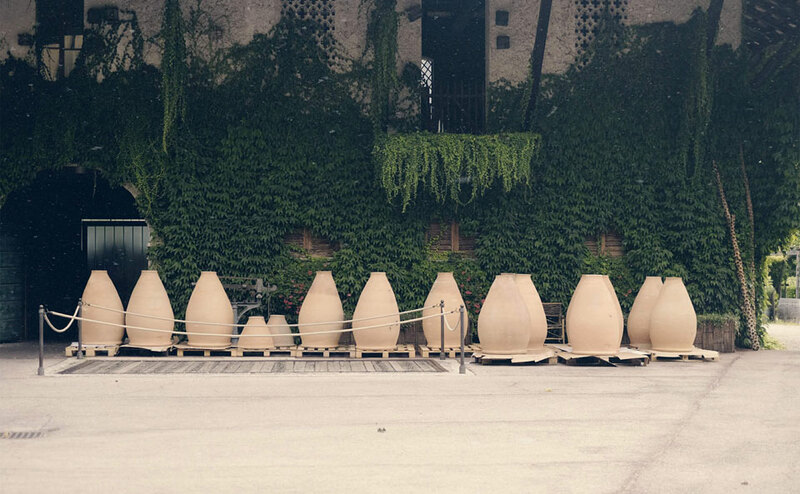 Experiments with Spanish tinajas, or amphorae, began in 2013 and have continued ever since. A journey into the cellar with Elisabetta after our vineyard tour is astounding. 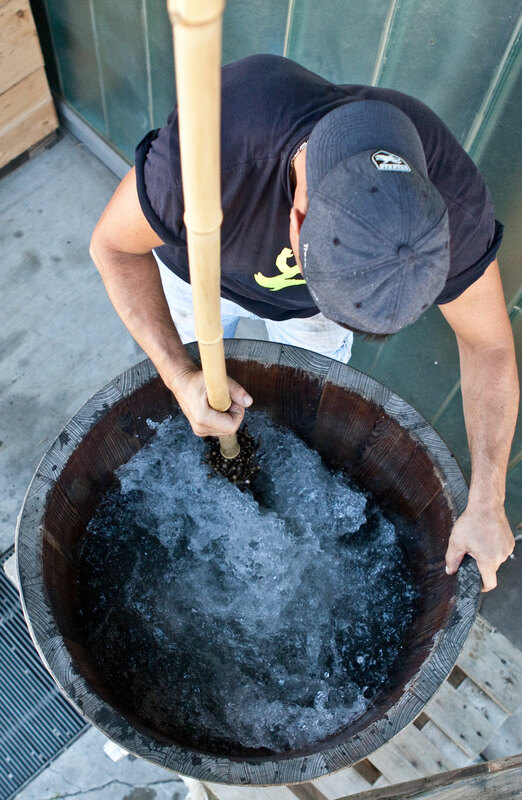 Moodily lit, it is cut by shafts of light, and the sight of 175 tinajas happily bubbling away is an amazing experience. Today, Elisabetta is joined by three of her children Emilio, Theo and Myrtha, who take an active role in the running of the estate, Emilio taking over the head winemaking from his mother in 2012. In the tasting room upstairs we run through the range of wines. The Fontanasanta Manzoni Bianco (A$55) is sprightly and taut with seven days of skin contact in cement tanks followed by 12 months in acacia casks. Textured and nutty with pure nashi pear fruits and citrus flashes. The Fontanasanta Nosiola (A$85) with eight months of maceration in tinajas followed by two months of ageing in acacia and oak casks shows more apple and citrus tones with soft spice notes coming into play. Again, the texture is excellent. The Fuoripista Pinot Grigio (A$85), a skin contact/amber/orange wine and a collaboration with Marco Devigili, a biodynamic winemaker in the Campo Rotaliano, sees eight months on skins in tinajas and is a beautifully coloured, textural wine. Notes of tangerine, pear and dried citrus fruits mingle with spice, tea leaves and light herbs. The quiver of teroldego wines are where the estate excels. First, a vin de soif style offering, the Lezer (A$50), produced from around 20 different parcels, some aged in tinajas, others in stainless steel, oak, or cement. It’s light on its feet, zesty with plenty of velocity and pure vivid fruit; a wine to be consumed young and one that celebrates the exuberance of its youth. The entry-level Teroldego Vigneti delle Dolomiti IGT (A$53) is fermented in cement with up to 20% whole bunches and aged for 12 months in cement and wooden foudres. Bright red and dark fruits, laden with spice and floral notes; pure with a savoury edge. The Teroldego Granato Vigneti delle Dolomiti IGT (A$142) is more serious, fermented in open oak casks and aged in barrel for 15 months. Deeper tones here, darker fruits, more structure, grip and concentration, weighted beautifully, with a vivid freshness. 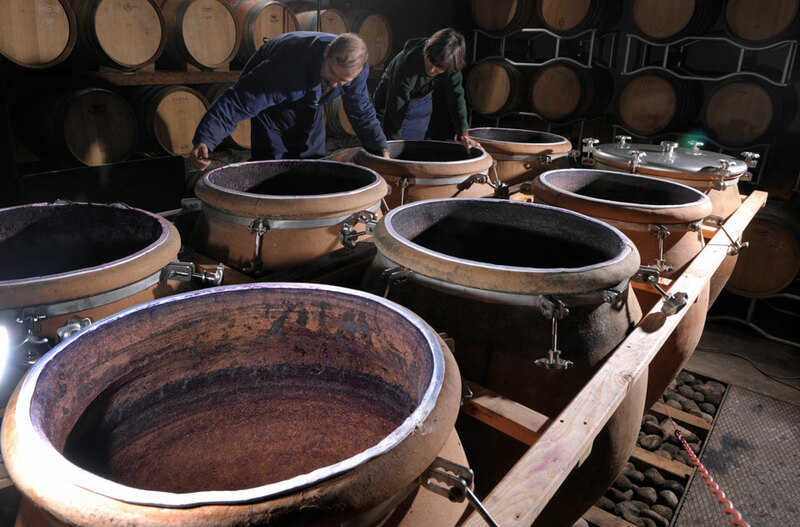 Both of the Campo Rotaliano single-vineyard teroldego wines, the Morei and the Sgarzon, see eight months on their skins in clay tinajas, are left until blending and then rested in cement before bottling. 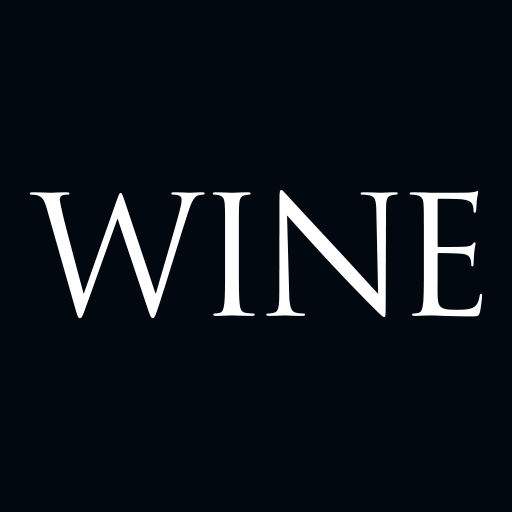 The wines were released from 1987 through to 1999 when they were discontinued. Production was only resumed in 2009 when the estate was certified biodynamic and started to age wines in tinajas. The Morei (A$85), off sandier soils, is fruit-driven and elegant with red cherry and berry fruits, spice notes with compact tannins and plenty of minerality. The Sgarzon (A$85), off the more gravelly soils, is more assertive with a funky edge, plenty of spice, a stony line of tannins and bright acidity. Sometimes it takes one person to act, to inspire and show what a region and/or grape variety is capable of. Elisabetta Foradori has been a champion for teroldego. She’s a vigneron who has a thoughtful approach in both vineyard and cellar and an enquiring mind, and who has undoubtedly been a great influence on the new generation of winemakers in the region and further afield. So we settled in for another hour, helping in the kitchen and enjoying the Foradori wines over a meal of local cheese, salumi and perfect pasta. Great food, conversation, laughter and wines in their element, drinking beautifully. As I travel and visit producers, I have come to realise wines are very much an extension of both their site and the personality of the people who craft them: composed, graceful and welcoming. The wines of Foradori, in particular the teroldego, just reinforce that lovely thought.